Published on Friday, February 17, 2017. This article appears in the February/March 2017 issue of American Craft Magazine. Gustav Reyes began his jewelry career making custom wedding rings. 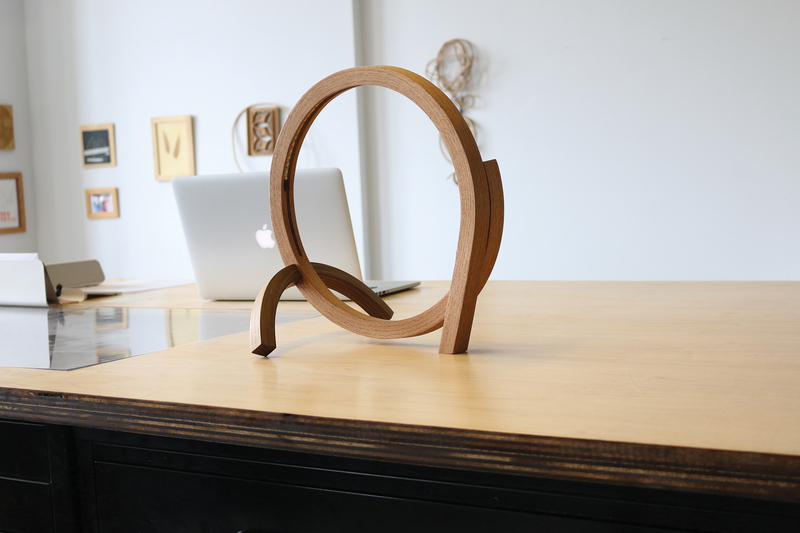 Customers often send him material – wood, stones – with a story behind it, which he incorporates into the piece. He finds it makes the work especially meaningful, not only for the clients, but also for him. A bonus: They take good care of the rings, “just like they ought to take care of their relationship,” he says. 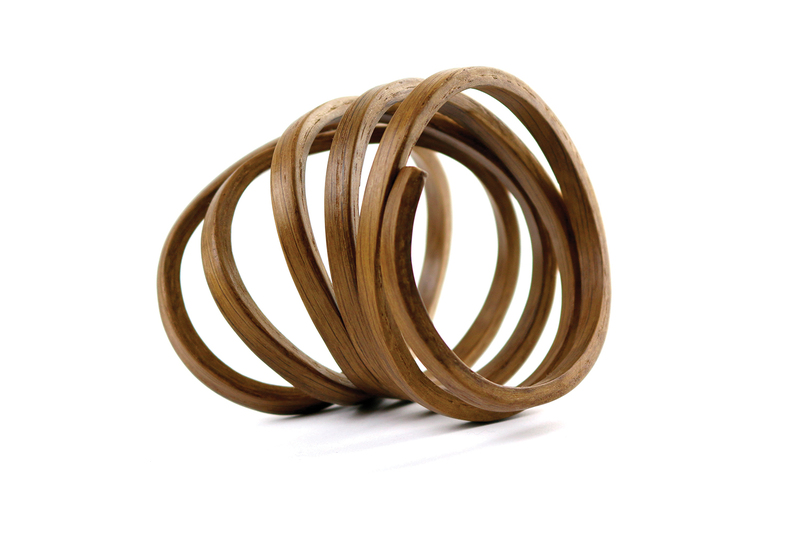 Reyes’ Ad Idem rings (far left and center) use wood he salvages from other crafts­people. The custom wedding band sets are from his Simply Wood Rings line. A client provided the gemstone ring, which Reyes surrounded with rosewood. On the far right, a ring with interior wood from a pew. Reyes gratefully attributes his success to support from his wife and parents. His family moved back and forth between the US and Mexico, where he was born, settling in the US in 1973 when he was 5 years old. The family made Chicago their home, and Reyes’ Puerto Rican father, a carpenter who worked construction, sometimes brought along his young son to work sites. There, he taught him woodworking basics and impressed on him the pride of good workmanship. They spent time together like that until Reyes was 11, when his father was killed in a work accident. “My father was my hero,” he remembers. Some people never really recover from tragedies like that, and Reyes becomes emotional when he recalls how he made it through. “I coped with his sudden loss by making little dollhouses,” he says. “I was absolutely obsessed with building small spaces for a good long while.” His mother’s help was crucial; she was a rock for Reyes and his siblings. She encouraged his artistic inclinations through the teen years and supported him while he studied painting and drawing at the School of the Art Institute of Chicago from 1986 to 1988. Reyes soon became a husband and breadwinner, working a variety of jobs for the next few years while making wooden boxes in a small workshop in his basement. He and his wife carefully planned their next steps to make his dream of being a full-time woodworker a reality. The turning point came in 2005; he had quit his day job and opened an Etsy shop. When he was featured on the Etsy blog, people began to take notice. But that was only the beginning. Shortly after he became self-employed, his wife, who has a metal allergy, came to him with a question. 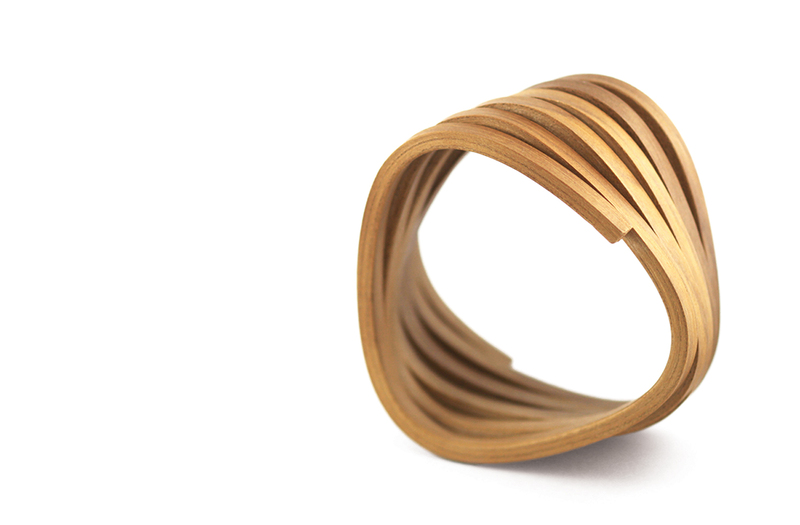 “She had curled a piece of paper into a ring and wanted to know if I could build her a ring as thin as that paper – only made from wood,” he says. The challenge was all he needed to move in an entirely new direction. 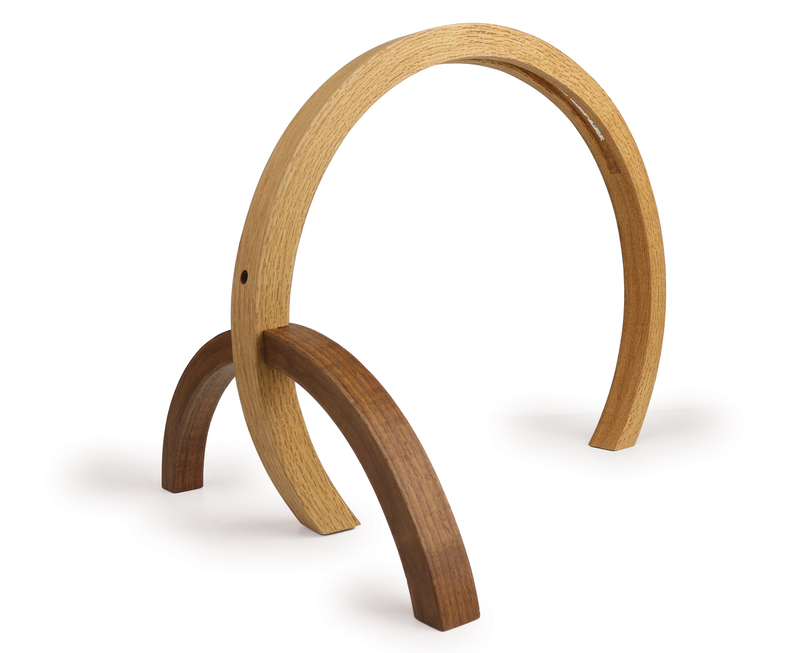 At the Art Institute, Reyes had learned about a steam-based wood-bending process invented in the early 19th century by German-Austrian cabinetmaker Michael Thonet. He began researching the technique in earnest, to learn how to adapt it to a small scale. “To this day, it never ceases to amaze me that a material heavy and solid enough to hold up a house can also be rendered soft, lightweight, and malleable when treated differently,” he says. As his customers take care, so does Reyes. He believes earnestly that, as human beings, we should be conscious of our environment, take only what is needed from it, and leave hardly a trace behind. 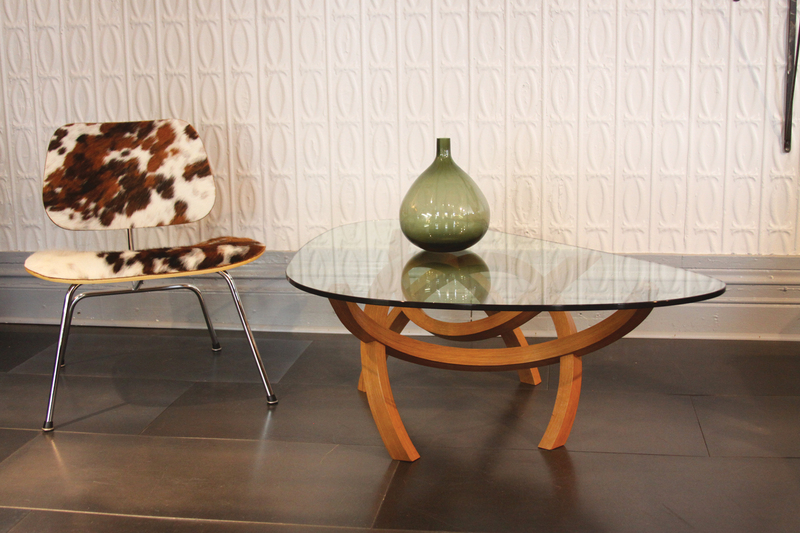 That’s why he favors wood: Eventually it disintegrates without harming its surroundings. Looking around the artist’s 4,000-square-foot studio in Chicago’s Pilsen neighborhood, you half expect Tyra Banks to sashay in at any moment and pull one of his large signature necklaces from the display to show off in a photo shoot. Located on the fifth floor of what used to be an old factory, with whitewashed walls and tall windows overlooking the Chicago skyline in the distance, the space feels industrial and modern, yet airy and calm. 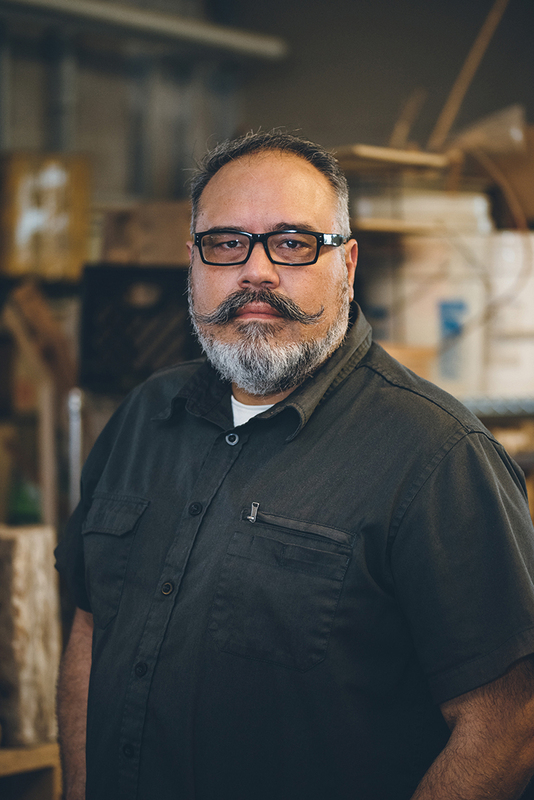 Reyes and two employees work in his striking showroom, running the administrative side of his business, while two other employees create Reyes’ wooden rings in the adjacent workshop under his direction. A door between the spaces muffles the humming of the machines and tools. Mastermind Reyes moves easily between desk duty and woodshop many times a day. His next big project: opening a storefront and gallery space in Chicago. Stay tuned. Brigitte Martin is the founder and editor of Crafthaus, and president-elect of the Society of North American Goldsmiths. 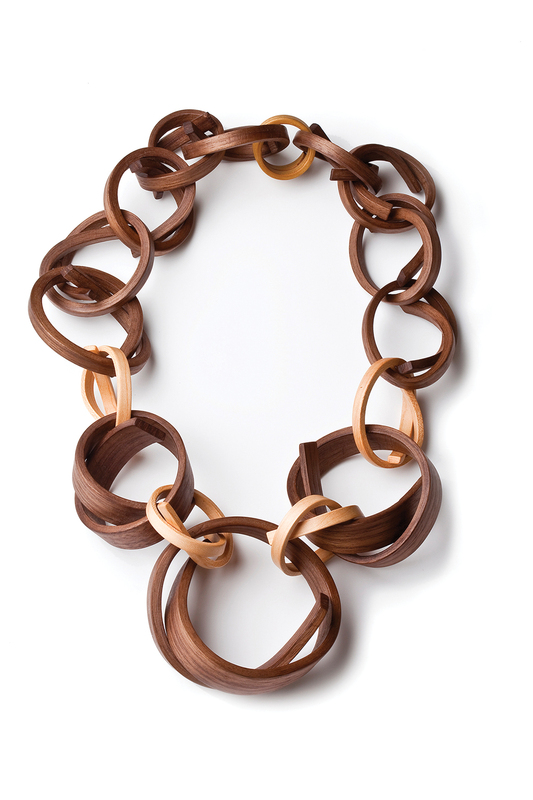 Following the success of Simply Wood Rings, Reyes developed his eponymous jewelry line in 2008, known for its bigger, bolder designs. 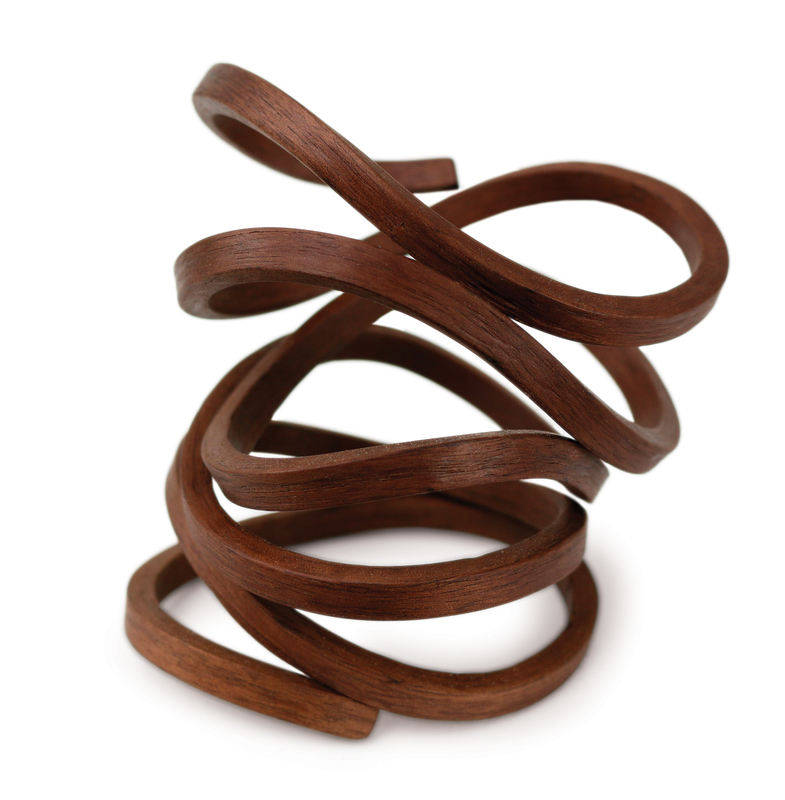 Tie Me Knot, 2012, walnut, hickory, 28 in. 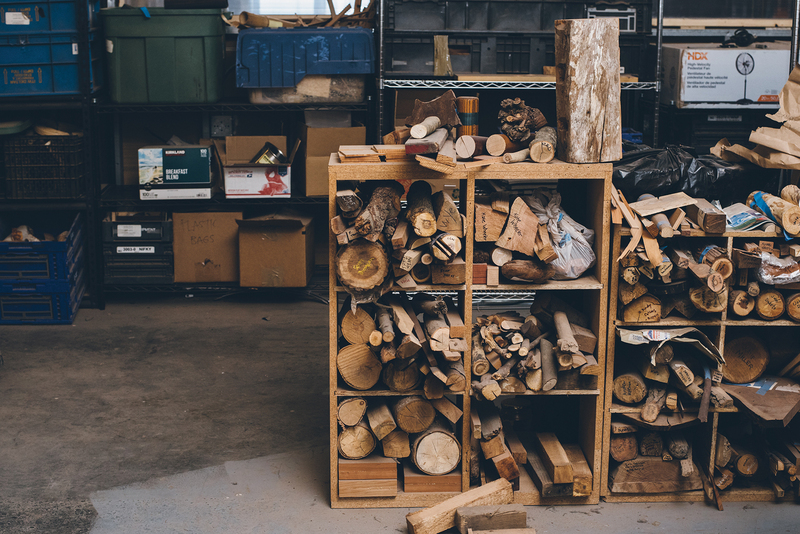 Wood is neatly stacked in Reyes’ studio, labeled with the names of clients who sent it.